The Sony F5/F55 Top Handle from SHAPE is designed to fit on the Sony F5 and F55 cameras, allowing a firm grip. 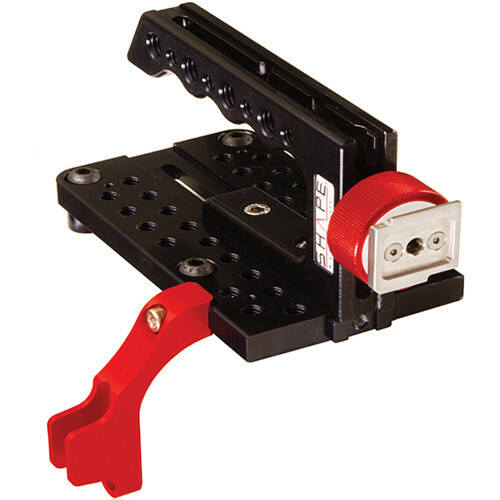 It provides a longer handle on top of the Sony F5 or F55 cameras and comes with a cable protector. Box Dimensions (LxWxH) 8.1 x 4.6 x 3.3"
Sony F5/F55 Top Handle is rated 4.0 out of 5 by 1. Rated 4 out of 5 by Chris S. from Nice feature, great price I finally decided on an aftermarket solution for the F5's poorly designed viewfinder cable attachment. As a bonus, I got a better than expected handle and viewfinder mount that can be adjusted to much more comfortable positions. The Shape viewfinder mount allows you to position it along the top of the handle so that you can position the viewfinder for interviews as well as handheld. The multiple 1/4-20 holes in the plate are handy for mounting a monitor on an arm or my shotgun mic mount. The only problem I've encountered is detaching the viewfinder from the camera. The guard makes it difficult to get my large fingers in the slots to release the cable. I would rather have that problem than risk breaking the camera port, it has been bullet proof so far.